Our Black Belt Corner series continues with Kris Shaw. She started training in 1997 in Texas but soon moved to Manhattan Beach, California, for work. In California Kris continued her training under Rigan Machado, and received her blue belt, and purple belt from him. 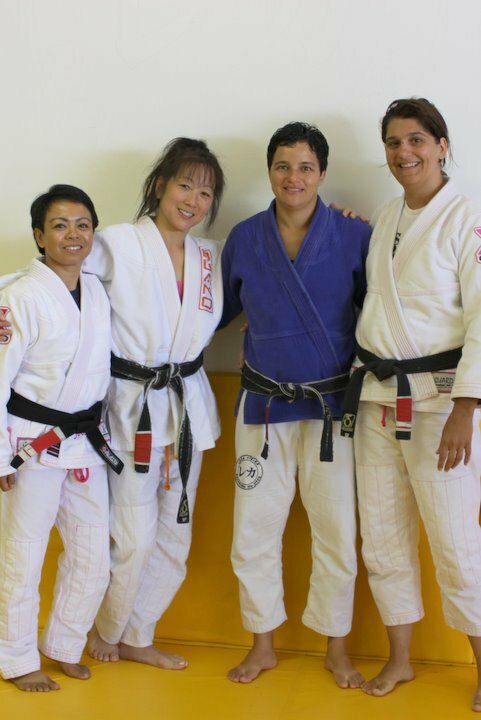 In 2000, Leka Vieira came to Rigan Machado’s, and founded the legendary womens jiu-jitsu team. Despite not speaking any English, Leka built a very successful team, and the ladies won some major trophies. Kris was an active competitor at that time, and won several championships in Brazil, and the US. In 2004, Leka established her own academy, which was the first all female academy anywhere. Kris followed her instructor to the new academy, and received her black belt from Leka in May of 2005. Currently she trains under Mauricio “Tinguinha” Mariano, and a few months ago was promoted to 2nd degree black belt. Kris is a mother of four young daughters, the owner of BJJ Legends Magazine, and on top of that teaches kids’ BJJ classes. Which belt level has been the most challenging for you, and how did you overcome the challenges? Black, black, black! Definitely black belt! My ortho is telling me that I have to quit training forever! I have a bad knee, and I need a knee replacement but I’m too young for the surgery, so it’s a catch 22. I feel my game slipping away. I want to feel the glory days, and run through everybody but now everybody runs through me. I have family commitments that I try to balance. The other weekend I was at a kid’s birthday party but I really wanted to check out Five Tournament. I don’t compete anymore, and I don’t own an academy. I’m getting older, and the white belts are getting younger. You don’t really overcome getting older but I do make up for it by networking. I reached deep down, and figured out that the reason I still do jiu-jitsu is because of the people. We have a special, magic bond. Fight someone and you know that person. You can’t lie while you’re sparring. The pretenses are stripped away, and pretty much if you hang through a competition class, I like you! What advice would you give to women who a have hard time in training? 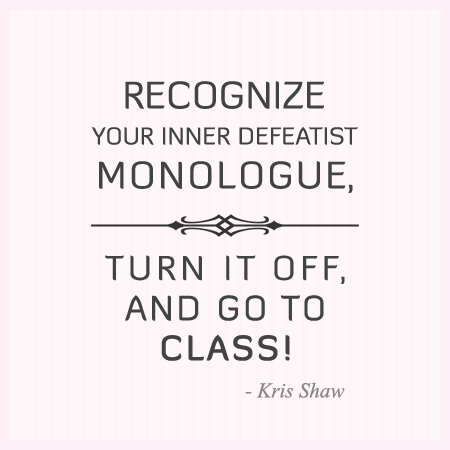 Is it your inner defeatist monologue? If you have an hour to get to class, and you’ve planned to go to all day, and that voice starts, you can’t go because if you leave now you will be late. You can’t go now because the couch is so comfortable. You can’t go now because the dog will miss you. Recognize it, turn it off, and go to class. Don’t argue with it, just turn it off! Everything else is out of your control, whether or not you get to class is within your control. Self-doubt is horrible, and it affects us all. It still creeps up on me. Again, you have to recognize it to stop it. Here’s where a BJJ BFF (best friend) is the helpful. My BJJ BFF has gone through the same things I have, and vice versa. It’s funny because it’s like a script. I tell her, “My instructor didn’t even LOOK at me today!” And a week or a month later, she will tell me that her instructor doesn’t even know if she is alive. So if you can, get yourself a BJJ BFF. Retail therapy. Buy some new gear. You have to go to class if you just dropped $180 on a new gi! Now counter that with some philanthropy. Give an old gi, give a new gi, go to a grapplethon, and roll for charity. Go to a women’s open mat and help a white belt. I definitely don’t have all the answers but I hope you stay on the mats and reach your goals! Thank you Kris. What a great article. Thanks for all the tips and all the encouragement. What an encouraging post! Thank you for your honesty.